In a year when a book about stats adapted into a movie might actually win a bunch of Oscars, it’s appropriate to find a team that generates far more excitement from its new front office than its collection of ragtag on-field talent. Led by owner Jim Crane and CEO George Postolos, the Houston Astros have begun revamping the business and baseball sides of the organization, with the most visible baseball hires being GM Jeff Luhnow, Luhnow’s right-hand man Sig Mejdal, and PITCHf/x guru Mike Fast. 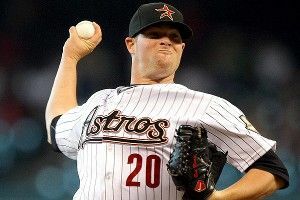 (For more on their massive rebuilding job, check out today’s feature on the Astros.) It’s going to take years to repair the Astros’ farm system, damaged by an organization that clung too long to veterans such as Lance Berkman and Roy Oswalt and failed to land high-level talent via the draft or international markets. For now, the focus will be on evaluating what little the Astros have got, with multiple losing seasons and three or more years of top-five picks likely on the way. When a team throws a bunch of new names into the lineup, it’s tempting to look at those players and conclude that they’re the team’s future. Not so with the Astros. Players like Schafer, Altuve, Martinez, Bogusevic, and Paredes all got their first taste of everyday play last season, and now get to experience their first brush with secure starting jobs on Opening Day. But really, most of these guys — and maybe all of them — are just place holders, granted everyday jobs while the next generation of Astros prospects gets cultivated on the farm. That’s not to say that these default starters, the product of years of lousy scouting and player development by the team’s previous brain trust, can’t produce a few surprises. Martinez showed flashes of pop with the big club last year, and will get a chance to build on the big minor league numbers he posted in 2010 and 2011. Altuve might be the only player in baseball who looks up to Dustin Pedroia, but he also looks like he can hit, with excellent contact skills that could translate to a near-.300 average while playing a premium position. That the notoriously optimistic Bill James projections think the Astros’ projected leadoff man will hit like a poor man’s Carlos Zambrano isn’t great news. Still, it’s conceivable that a couple of current Astros could still be on the team by the time top prospect Jonathan Singleton and the high picks Houston collects over the next couple of losing seasons make it to the big leagues. Cashing in reliever Mark Melancon for potentially above-average shortstop Lowrie was an especially logical move, given how much more important finding up-the-middle talent is to the Astros’ future than relief pitchers, even good ones. Some talented names here, and also a good chance that 60 percent of the rotation will turn over by July 31. Rodriguez’s name came up frequently in trade rumors early this offseason, before teams got scared away by the two years and $25.5 million he’s still owed on his contract. As the season progresses and teams’ pitching needs escalate, though, it’s not hard to envision Rodriguez and Myers (owed $11 million this year plus a $3 million buyout for 2013) attracting attention from other clubs. Add in Happ’s status as a fringe starter and Hernandez’s fungibility, and you have a rotation that should look very different by the stretch run. Jordan Lyles was rushed into the rotation last season at age 20, but still showed glimmers of excellence, striking out more than two batters for every one walk allowed. The new regime might be more patient before calling Lyles back up, but he’ll likely be starting by the summer. Jarred Cosart is the next-closest premium prospect to the majors, but he has only 36 innings above A-ball under his belt, and struggles with command. Norris. In a sense, the breakout’s already happened, with the right-hander striking out nearly a batter an inning last season over 31 starts, posting a solid 3.77 ERA and 3.73 xFIP. But after slicing more than one full walk off his ledger last season and setting a career high in innings pitched, there’s hope for more: a jump to 200 innings and a little bit of hit luck and you’ll see Norris in his first All-Star Game. He’ll almost certainly be the staff’s ace by season’s end. The Astros get to cash in key veterans for badly needed young talent. Seriously, there’s almost no scenario in which this team makes the playoffs, or even comes close, in 2012. But if Rodriguez and Myers turn in big first halves, maybe a team with playoff aspirations and a starting-pitching shortage (Reds? Red Sox?) pull the trigger. That, plus continued development for Altuve and one or two other young players would be a good outcome in year one of the new era. Nearly everything that could have gone wrong for this franchise already has over the past few seasons. Unless Luhnow gets bone spurs in his hippocampus, the slow-and-steady rebuilding job will proceed as planned.